I’m dialing in to look at shorter-term technical analysis as my risk management systems are suggesting a risk of a stock market decline is becoming elevated. Zooming in to shorter time frames, the U.S. stock market advance appears to be becoming exhausted. The chart below is the SPDR® S&P® 500 ETF, yesterday on a 5-minute chart. Now that’s zooming in! I’m not a day trader, but I’m monitoring the trend for signs of buying exhaustion and/or selling pressure to potentially take over. Yesterday this index ETF was up nearly .75% in the morning, then you can see it drifted down to close well below its VWAP for the day. The next chart shows the SPY trend going back for about six months. The recent stock advance has been impressive and I’m sure glad we participated in it, but I’m now applying some situational awareness. The strong momentum since the late December 2018 low could be becoming exhausted and may find some resistance for higher prices, at least temporarily. As a tactician, since we had heavy exposure to stocks, I’ve been gradually reducing exposure and today started hedged off some equity risk to offset some of my market risks. I did that as opposed to taking large profits and realizing taxable gains. Fortunately, we took advantage of last years volaltity and made the best of it by executing significant tax loss harvesting. This time I decided to hedge some of our gains rather than realize them. I may be wrong, but my risk management systems are elevated for at least a short term exhaustion, so I expect we’ll see some selling pressure overwhelm buying at some point from here. If it doesn’t, then it’s a good sign the momentum may be here to stay a while, but I’ll probably still wait for a reversal down to add more exposure in my tactically managed portfolio. My objective is asymmetric risk/reward, and from this starting point, I see more potential for downside than upside for stocks. My systems aren’t always right, but the magnitude of the gains are larger than the losses when it’s wrong. I call it ASYMMETRY®. Mike Shell and Shell Capital Management, LLC is a registered investment advisor and provides investment advice and portfolio management solely to clients with a signed and executed investment management agreement. The observations shared on this website are for general information only and are not specific advice, research, or buy or sell recommendations for any individual. Investing involves risk including the potential loss of principal an investor must be willing to bear. Past performance is no guarantee of future results. All information provided is deemed reliable, but is not guaranteed and should be independently verified. The presence of this website on the Internet shall in no direct or indirect way raise an implication that Shell Capital Management, LLC is offering to sell or soliciting to sell advisory services to residents of any state in which the firm is not registered as an investment advisor. Use of this website is subject to its terms and conditions. After gaining over 6% since the low on Christmas Eve, the S&P 500 declined -2.45% today. We can expect a wider range of prices in a volatility expansion after a -20% decline. I say it’s a volatility expansion because implied volatility is relatively elevated at 25.45, implying a 25% range of prices is implied by options prices on the S&P 500 stocks. Looking over its full history, we’ve seen the VIX trend higher, but it’s relatively elevated. Its long-term average is about 20. But, for mean reversing indicators like the VIX, the average doesn’t mean much since it doesn’t stay there. Another way I define a volatility expansion is realized volatility. The VIX is expected volatility implied by options prices, realized volatility is actual historical volatility. In the chart below I added an average true range over the past 14 days above the S&P 500 stock index price trend. We can see how volatility expanded as the price trend fell. Prices tend to spread out in a wider range in a downtrend. We can see this in the chart. There was a regime change from a low volatility uptrend to a downtrend with volatility expansion. The CBOE Put Call Ratios spiked up today. Zooming in to a 30 day period, we see the Index Put Call Ratio is about where it was at the lows in December. I believe the Index Put Call Ratio is a better indication of extremes in fear of lower prices because index options are mostly traded by professionals and used for hedging. The Equity Put Call Ratio is options on individual stocks and more non-professionals and tends to be more speculative. I explained it in Investor Sentiment into the New Year 2019. To get a longer view below is the past five years of the Put Call Ratios. They’ve been higher in 2015, but are clearly at elevated levels. It indicates the put volume on index options is 155% more than call volume, which suggests hedging or speculative bets the index will decline. Prices decline until the selling pressure is exhausted. Selling pressure is exhausted after those who want to sell have sold, which pushes prices down to a low enough point to attract buyers. To get an indication of when prices have trended down far enough to exhaust sellers and attract buyers, I look at the price trend itself as well as extremes investor sentiment and breadth. Below is the percent of stocks in the S&P 500 below their 200 day moving average. The percent of stocks above their 200 day moving average reversed back down… only 14% are in a positive uptrend. There are currently 505 stocks in the S&P 500. Of the 18 that are above their 50 day moving average, two are because they are being bought out Celgene CELG and Redhat RHT. Some of the others are kind of recession stocks like auto parts, discount store, and a gold stock: AZO ORLY DLTR NEM. The stock market is approaching oversold levels again but may get more oversold before reversing back up. One advantage of falling stock prices is as price falls, the dividend yield rises from that new price. 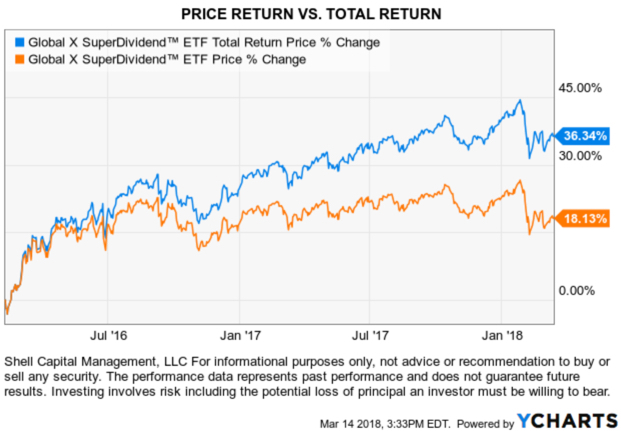 This is not a recommendation to buy or sell any security, but below is the price trend and dividend yield the Global X SuperDividend® ETF (SDIV). It invests in 100 of the highest dividend yielding equity securities in the world. We can observe as the price trends down, the dividend yield trends up. That is, if we buy high yielding assets at lower prices, the dividend payment is higher from that starting point assuming the companies keep paying their dividends. Below we can see how this ETF yield has increased to 9% as its price has fallen -35% off its high. Like any investment, it isn’t risk-free. Investing always involves risk, including the possible loss of principal. High yielding stocks are often speculative, high-risk investments. These companies can be paying out more than they can support and may reduce their dividends or stop paying dividends at any time, which could have a material adverse effect on the stock price of these companies and the Fund’s performance. International investments may involve risk of capital loss from unfavorable fluctuation in currency values, from differences in generally accepted accounting principles, or from economic or political instability in other nations. Emerging markets involve heightened risks related to the same factors as well as increased volatility and lower trading volume. The bottom line is; there is no free lunch. If we want the potential for return, we have to take risks. If this is the early stage of a larger decline, it will unfold with many up and down swings along the way. It will get overbought/oversold over and over and sometimes stay that way longer. I shared it in An exhaustive stock market analysis… continued. Emotional undisciplined investors, traders, and portfolios managers will be destroyed in a volatility expansion. They’ll swing from the fear of missing out to the fear of losing money as the stock market swings up and down. Self-discipline and emotional fortitude are essential to be an investment manager. We’ll see how it all unfolds from here. I guess An exhaustive analysis of the U.S. stock market wasn’t exhaustive enough, because I now have a few things to add. First, since the financial news media, as well as social media like Twitter, is so bearish with all kinds of narratives about why the stock market is falling, I’ll go ahead and discuss it here. This observation will not be complete without first reading An exhaustive analysis of the U.S. stock market so you know where I am coming from. If you haven’t read it already, I would before continuing so you understand the full context. It is the financial news media’s business to report new information. We all know that if they want to get people to tune in, the fastest way is to provide provocative and alarming headlines and commentary. So, we shouldn’t be surprised to see distressing news. There are always many reasons for the stock market to trend up or down. It isn’t hard to write some narrative attempting to explain it. The reality is, there are all kinds of causes that create an effect. None of them alone drive price trends. Ultimately, what drives price trends is behavior and sentiment which drives supply and demand. Behavior and investor sentiment may be impacted by the news and what people decide to believe. I often say “what you believe is true, for you” even if it isn’t actually true. A person’s beliefs could be completely wrong and could be scientifically disproven, but if they still believe it, it’s their truth, so it’s true – for them. So, whatever you choose to believe is going to be your truth, so I suggest weighing the evidence to determine the truth if you want it to be more accurate. In science, we can’t prove the truth to be true, we can only disprove it as untrue. Let’s look at some truths that I believe to be true based on empirical observation of facts. The biggest news headline is probably the government shutdown. There have been twenty U.S. government shutdowns over the budget since 1976 by both political parties. Half of the time it was followed by stock gains and half the time declines. The average result is -0.40% and the median is 0%. So, historically a government shutdown hasn’t seemed to drive prices. Below is the table. It is what it is. Yesterday evening Steven Mnuchin, the 77th Secretary of the Treasury, tweeted a note that he had called the nations six largest banks to confirm they have ample liquidy for consumer and business lending and other market operations. The words “Plunge Protection Team” started trending in social media. Much of the response has been negative, which seems odd to me. Since when was doing “channel checks” not a good idea? There are many things going on all over the world all the time, so we can always find narratives to fit the price trend and believe it’s the driver. Narratives and news also seem to drive more emotional responses since people like to hear a story. I focus on the data, which is the price action. Whatever is driving the markets is reflected in the price trend. The price trend is the final arbiter. Nothing else matters. The Morningstar table of index performance shows the 2018 total return of large, mid, small cap stocks along with growth, value, and blend. The most popular broad-based indexes like the S&P 500 and Dow Jones Industrial Average show 2018 is ending just the opposite of the way it started. Let’s look at some price trends. Yesterday I shared the Bullish Percent measures on the broad stock market indexes and each individual sector. We observed the percent of stocks in all sectors except for the Utility sector was already at historical lows after previous market declines. After today’s price action, we have some updated observations to explore. The S&P 500 is in a bear market, commonly defined as a -20% decline from a prior price peak. What is most interesting is how fast it reached -20%. In the chart below, I included the S&P 500 Total Return Index (including dividends), the S&P 500 Index price only, and the S&P 500 ETF (SPY). On a total return basis, the S&P 500 Total Return Index that includes no costs or fees didn’t quite close down -20% from its high, but the rest did. It’s close enough. Though the stock indexes had declined -10% earlier this year, they had recovered to new highs by September and it appeared the primary uptrend would resume. Starting in October, the stock market declined again and attempted to recover twice in November. What came next was probably most shocking to those who follow market seasonality; the stock indexes are down over -15% in the month of December, which is historically one of the strongest months of the year. It seems this decline happening so fast and at the end of a calendar year is going to make it seem more significant. Because it’s at year end it results in a “down year” instead of having time to recover during the normally seasonally strong period after October. The period from November to April historically has stronger stock market gains on average than the other months. Not this year. The Utility sector reverses down to participation in the market decline. Yesterday I had highlighted the top range of the Bullish Percent chart in yellow to mark the high-risk zone above 70%. After today, the Utilities sector has declined below that range. Individual Utility stocks are now participating in the stock market decline. The Utilities sector ETF declined over -4% today and is now slightly down for the year. During significant market declines, diversification sometimes isn’t the crutch it is promoted to be by most of the investment industry. Broad asset allocation and diversification do not assure a profit or protect against a loss in a declining market. In declining markets, we often see price trends cluster more as serial correlation. That is, prices begin to fall more just because they are falling. Investors sell because prices are falling. So, stocks, sectors, and markets can all become highly correlated to the downside. By the end of a market decline, all stocks, sectors, and markets are often participating. The upside is, this panic selling is capitulation as the final weak holders stop resisting and begin to “sell everything!” We eventually see the selling dry up and buyers step in with enthusiasm at lower prices. Well, that has turned out to be an understatement I guess. What’s more important is what I actually did. On August 23th as the stock market began to appear overbought on a short-term basis, I took partial profits on our leading momentum stock positions. In hindsight, it would have been better to sell them all. By September 26th (when I wrote the above) I had reduced our exposure to only around 30% stocks and the rest in Treasury bonds. It still didn’t turn out perfectly as the stocks we did hold declined, too, and in many cases even more than the stock indexes. As we entered October, I shared a new observation “Here comes the volatility expansion” as stock prices fell and volatility increased. As prices fell to lower and lower levels, I started adding more exposure. At this point, prices have broadly become more and more extremely “oversold” and sentiment has become more negative. This has been a hostile period for every strategy, but I’ve been here before. By the way, I have been a tactical portfolio manager for over twenty years now. The highlight of my performance history has been the bear markets. I executed especially well in the October 2007 to March 2009 period when the S&P fell -56%. My worst peak to trough drawdown during that period was only -14.3% and I recovered from it about six months or so later. That was compared to a -56% drop in the stock index that took several years to recover. In fact, I did so well at a time when very few did that it was almost unbelievable, so I had my performance verified by a third party accountant. I have considered writing about it and sharing the commentaries I wrote during the period and the tactical decisions I made. Make no mistake, it wasn’t easy nor was it pleasant. I didn’t lose the money others did, so I was in a position of strength, but it was still a challenging time. What I will tell you is I entered and exited various positions about seven or eight times over that two year period. We never know in advance when the low is in, or when a trend will reverse back down. Buy and hold investors just take the beating, I entered and exited hoping the average gain exceeds the average losses. The swings are the challenge. It takes great discipline to do what needs to be done. Most people had very poor results, for me to create good results, I necessarily had to feel and do the opposite of most people. The market analysis I’m sharing here as observations aren’t necessarily the exact signals I used to enter and exit, but they are part of the indicators I monitored during the crash. Every trend is unique. We have no assurance my methods will do as well as in the past. But, the one thing I feel confident in is I’ve been here before. This ain’t my first rodeo. I know what I’m doing and I’m disciplined in my execution. That’s all I can do. I’m dealing with the certainty of uncertainty, so I can’t guarantee I’ll do as well the next time around, but I am better prepared now than I was then. So bring it. Get some. I’m ready. Yesterday I shared the extreme levels of Bullish Percent indicators for the broad market and sectors as well as other indicators like the Put/Call Ratios. I want to add to these observations with more indicators reaching an extreme. I’ve not seen these extremes since 2008 and 2009. The Nasdaq has declined the most which is no surprise since it’s mostly emerging companies and heavily weighted in Technology. Market conditions have pushed the number of Nasdaq stocks hitting new lows to over 1,100 as of last week. Since the total number of Nasdaq issues is about 3,200 that has caused the value, in percentage terms, to jump to over 30% of the total. As you can see, the last time this many Nasdaq stocks hit new lows was the October 2008 low and the March 2009 low. The current level has exceeded other corrections since then and even the “Tech Wreck” after 2000. At this point, it becomes a contrarian indicator. To no surprise, the same trend is true for NYSE stocks. As of last week, the percent of stocks listed on the New York Stock Exchange at new lows has reached the levels of past correction lows, but not as high as the 2008 period. From here, I’ll share my observations of the relative strength and momentum of the sectors and stocks within them so we can see how oversold they have become. We already looked at the Bullish Percent of each sector yesterday, this is just more weight of the evidence. First, I applied the Relative Strength Index to the S&P 500 daily chart. This RSI is only 14 days, so it’s a short-term momentum indicator that measures the magnitude of recent price changes to estimate overbought or oversold conditions. RSI oscillates between zero and 100, so it’s range bound and I consider it overbought above 70 and oversold below 30. Below we see the current level of 19 is very low over the past twenty years and is at or below the low level reached during past shorter-term market bottoms. However, we also see during prolonged bear markets like 2000 to 2003 and 2007 to 2009 it reached oversold conditions two to three times as the market cycles up and down to a lower low. Zooming out from the daily chart to the weekly chart, we see the extremes more clearly and this is one of them. On a weekly basis, this oversold indicator is as low as it’s been only at the low points of the last two major bear markets. Zooming out one more time from the weekly to the monthly chart, we observe a monthly data point only highlights the most extreme lows. It’s the same data but ignores the intra-month data. On a monthly basis, the current measure isn’t as low as it reached at the bear market lows in March 2009 or October 2002. For it to reach that level, I expect the green area I highlighted in the price chart to be filled. In other words, this suggests to me if this is a big bear market, we could ultimately see the price trend decline to at least the 2015 high. It only takes about -10% to reach that level. However, as we saw in the shorter term readings, if history is a guide, it would most likely cycle back up before it would trend back down. You can probably see why I stress that longer-term price trends swing up and down as they unfold. Within a big move of 50%, we see swings around 10 – 20% along the way. Let’s continue with this same concept to see how each sector looks. The broader indexes are made of the sectors, so if we want an idea of the internal condition of the broader market it is useful to look at each sector as I did yesterday with the Bullish Percent indexes. Since we just had a -15% correction in August 2015 and January 2016, we’ll just focus on the daily RSI looking back four years to cover that period. Keep in mind, none of this is advice to buy or sell any of these sectors or markets. We only provide advice and investment management to clients with an executed investment management agreement. This observation is for informational and educational purposes only. The Consumer Discretionary sector is as oversold as it’s been at historically low price points. A trend can always continue down more and stay down longer than expected, but by this measure, it has reached a point I expect to see a reversal up. The price trend of Consumer Staples that is considered to be a defensive sector initially held up, but then the selling pressure got to it. It’s oversold as it’s been at historical lows. The Energy sector has declined the most in 2018 and is oversold similar to prior price trend lows. We can see the indicator isn’t perfect as a falling trend sometimes reverses up temporarily, then trends back down to a lower low only to get oversold again. We’ll observe this same behavior at different times in each sector or market. The Financial sector is deeply oversold to the point it has reached at prior lows. Any market could always crash down more, but Financials have reached a point we should expect to see at least a temporary reversal up. Healthcare is a sector that isn’t expected to be impacted by the economy, but it has participated in the downtrend. It’s also reached the oversold point today. You can see what happened historically after it reached this level. If history is a guide, we should watch for a reversal. The Industrial sector is trending down but has now reached a point we could see a reversal back up. Clearly, the market decline has been broad as every sector has participated. The Materials sector reached the oversold level today. Real Estate has not been spared during the selloff. It has now reached an oversold level normally seen at lows, but historically it’s cycled up and down a few times before reversing up meaningfully. That can be the case for any of them. The Technology sector had been one of the best-looking uptrends the past few years. It’s now oversold after today’s action. Up until today, the Utility sector was the lone survivor, but it was one of todays biggest losers. It’s falling so sharply so fast it’s now oversold with the other sectors. After prices have declined, I look for indications that selling pressure may be getting more exhausted and driving prices to a low enough point to attract buying demand. That’s what it takes to reverse the trend. I’ve been here before. I’ve executed through these hostile conditions as a tactical operator. The more hostile it gets, the more focused in the zone I get. After the stock market has already declined, I start looking for this kind of panic selling and extreme levels for a countertrend. We’re seeing those levels now. Sure, it could get worse, but we have reached a point that lower prices are more and more likely to result in a reversal back up. I’m just going to do what I do. It’s a big task for me to use the word exhaustive when it comes to stock market analysis. Exhaustive is examining, including, or considering all elements or aspects; fully comprehensive. There is no way to consider all elements, but we can focus on how the price trends are actually trending and the behavior and sentiment that is driving the trend. A skillful trend follower wants to catch a trend early in its stage and capitalize on it until it ends. That’s hard to argue against. Who would rather enter a trend later in its stage? Who wants to catch less of the trend? My point is: we should want to capture as much of a trend as possible and for me, that necessarily means I want to not only determine the direction of a trend but also observe when trends are likely to change direction. I want to share this with you so you know where I’m coming from. My objective is all about ASYMMETRY®. For me, it’s all about asymmetric risk/reward. Asymmetric risk/reward is an expectation of average gains larger than average losses. It could be as simple as risking a loss of 10% for the potential to earn a gain of 20%. That’s an asymmetric payoff. If I did that with just a 50% probability, I would earn 5% on average. How much total return we would achieve over time would be controlled by how much capital I risk in each position. How much I risk in each position across the portfolio dictates my portfolio drawdown. The portfolio drawdowns relative to total return since inception creates an asymmetric risk/reward profile. So, everything I do involves ASYMMETRY® and that’s why it’s my trademark. As you read my observations you can probably see how I’m looking for exposure at lower risk levels and less exposure at higher risk levels and that can be counterintuitive. It can certainly go against investor sentiment and emotions at times. Every decision we make is in the present moment. We can do nothing in the past. We can do nothing in the future. The only time we can do something is now, or not. To get an understanding of an asymmetric risk/reward let’s look at an idealized situation. The chart below, unnamed because it doesn’t matter, is a price trend that gained over 100%. If your objective is an asymmetric payoff and you have perfect hindsight, what would be your best entry point? Clearly, the price is trending from the lower left to the upper right, so the answer is the lowest price possible. As I said, in the real world we don’t know in advance the trend will continue, so we have to be willing to place our bet and let it unfold. When I enter a trend, I determine how much capital I’ll risk to see if it becomes an asymmetric payoff. If we were looking at the trend in 2016 with perfect hindsight, where would be the very best entry? Of course if would be the -15% dips in 2015 and 2016. The trouble is, as the price is falling sharply, it never seems there will be a catalyst to make the market trend back up. The news is always bad. Investor sentiment is very bearish. The sky is falling and all people want to do is duck for cover. After trends have moved, I find it more productive to look for a change of trend. After price trends up, I start looking for signs of a potential countertrend back down. After prices have fallen, I start looking for signs of a potential countertrend back up. What I do as a tactical portfolio manager is systematic rules-based. Although, it isn’t so mechanical that my computers are doing it all and executing trades. I am Man + Machine, not Machine – Man. I make no bones about it. I ultimately make tactical decisions that are informed by all of the proprietary systems I’ve developed over the past two decades. Some of my systems are more automated than others, but ultimately I am the portfolio manager. So, when I share market analysis observations, this is something different than specific trading signals to enter and exit. Market analysis is something I do to gain insights from my observations. Observations are the action or process of observing something carefully in order to gain information. Insights are the capacity to gain an accurate and deep intuitive understanding of something. I can share my observations of what is going on, but I can’t necessarily give you the insight to understand it. Understanding is up to you. To gain an accurate and deep intuitive understanding of something you have to study it closely. So, you can probably see why I believe it’s useful to do market analysis to get an understanding of the probabilities and possibilities. I do it by looking at the current price trend and where it’s been and more likely to go next. This is the longest bull market in history. At 9 years old, it’s very aged. The average length of a bull market is 4 to 5 years. Twice the average is aged by any measure. The Shiller PE Ratio was the second highest, ever. Only the 1999 bubble was higher. When the stock market is trading so expensive, we have to be prepared for the trend to reverse the other direction. Below is a 20-year monthly chart of the S&P 500. I added the green highlight to show the current price is only -35% from the October 2007 high eleven years ago. Losses are asymmetric as they compound exponentially. Losses erode gains asymmetrically. For example, the price gain from the 2007 high to the current price is 56%, but it only takes -35% to decline back to that point. You may also consider the stock index is only 56% higher than its 2000 peak eighteen years ago. In The REAL Length of the Average Bull Market I wrote: “Whether you believe the average bull market lasts 39 months, 50 months, or 68 months, it seems the current one is likely late in its stage at 54 months as of September 2013.” Yes, I was saying 5 years ago the trend seemed late stage – and it was. It just continued anyway, though was interrupted by two declines in the range of -15% in 2015 and 2016. At the same time in late 2013, the Shiller PE Ratio was increasing to a very overvalued level. It only kept going higher. By January of this year, it reached 33x earnings, the second highest ever. In fact, the only two times it reached this extreme the stock market followed with the Great Depression crash and the -46% decline after 2000. After the current -18% decline in the S&P it is now down to 26.74. The median is around 15, secular bear markets often begin at 20 or higher, secular bull markets begin below 10. I’m guessing the unprecedented Quantitative Easing of the Federal Reserve helped to push the valuations to an extreme. The Fed is now unwinding the QE and raising interest rates, which may be partly why we are seeing prices fall. So, we certainly can’t overlook the situational awareness that this could eventually become a much worse bear market to the -50% level. However, if it does, it will usually unfold with many swings up and down along the way. Falling prices are eventually followed by sharp countertrend moves up. It’s when we see lower highs and lower lows over time that it becomes more evident it’s a big bear market. One thing that’s been talked about a lot lately is the risk of an inverted yield curve. An inverted yield curve is when the short-term 3-month interest rate is higher than the long-term 30-year interest rate. 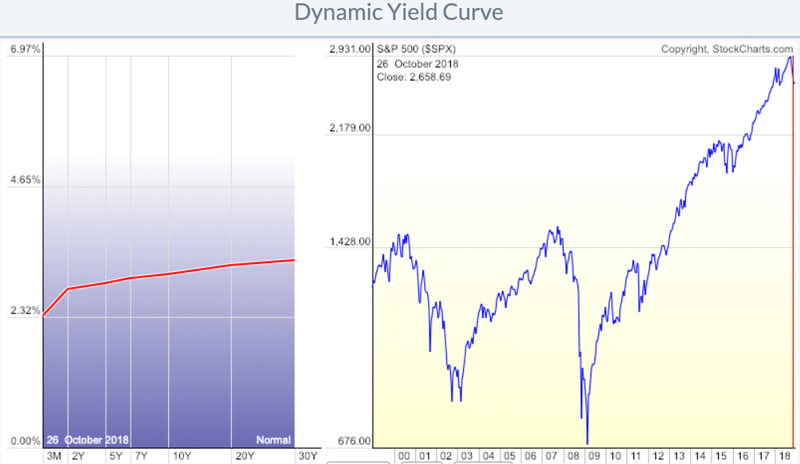 The yield curve hasn’t inverted like it did in December 2006 and August 2000. The yield curve doesn’t suggest a recession anytime soon. 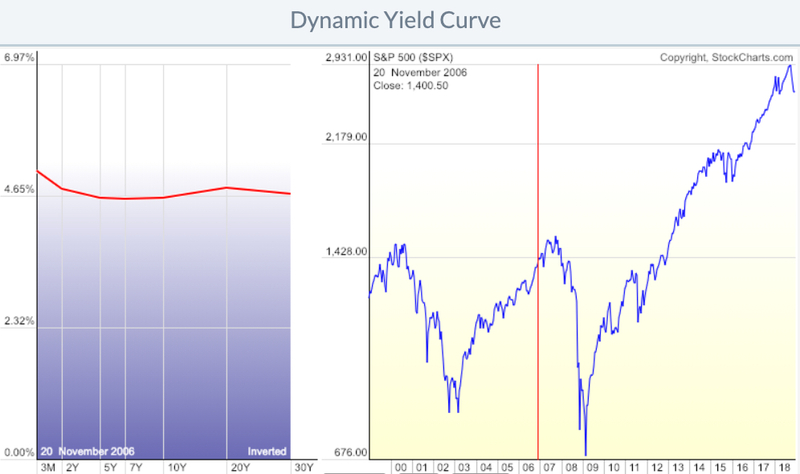 Here’s what an inverted yield curve looks like… when it inverted December 2006. A year later, the stock market started its decline of over -56%. 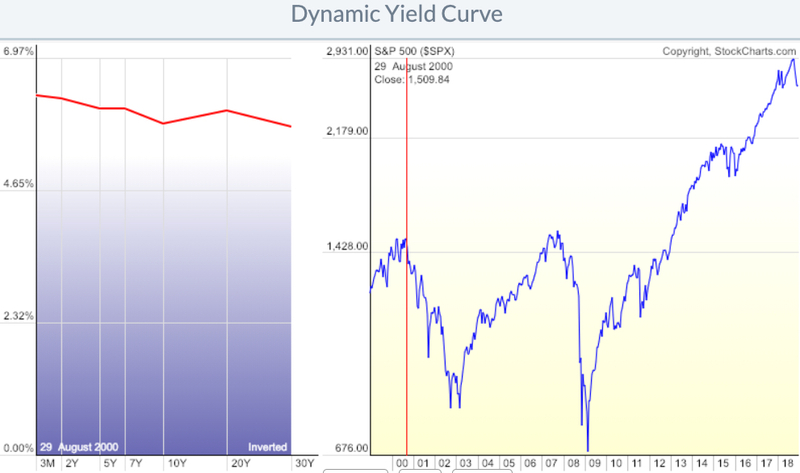 Here is the inverted yield curve in August 2000. In 2000, the yield curve was more accurate as to timing. The broad stock market declined -50%. The normal yield curve, 3 month vs 30 year, has not inverted. The long-term interest rate is higher than the short-term rate. For the yield curve to invert, the short-term interest rate will have to increase higher than the longer-term interest rate. Or, the long-term interest rate decrease below the short term. Either way, that hasn’t happened yet. How big are the stock market losses in 2018? Starting with a top-down view. First, the broad asset classes and styles like large, mid, small and value, growth, and blend using Morningstar Small Value is down the most at -19% YTD. Small Cap stocks are down the most. Large Growth and Large Cap generally have declined the least. The average U.S. Market index is down -8.58%. Keep in mind that index performance does not include any costs or fees and may not be invested in directly. The table above also includes sectors. Energy and Basic Materials are down over -20%, so any tactical system that avoided them had an advantage. Most investors don’t necessarily invest all of their money in the stock market all the time. Many instead do global asset allocation like I wrote about in Global asset allocation takes a beating in 2018. Fewer have an objective like mine; a global tactical strategy that shifts between markets by increasing and decreasing exposure aiming for asymmetric risk/reward. Here are iShares asset allocation ETFs YTD as a proxy for low-cost exposure to a global asset allocation of stocks and bonds all the time with no active risk management or tactical decisions. Each “risk level” has a different exposure to stocks/bonds. Even the most conservative allocation which is mostly invested in bonds is down -4% in 2018. I shared more detailed observations of global asset allocation Global asset allocation takes a beating in 2018. For a more exhaustive observation of GAA trends, here I included some of the more popular active global allocation funds along with the iShares ETFs that track allocation indexes. Clearly, 2018 has been a hostile year for most every strategy; static, balanced, or tactical. So, that’s the big picture. From there, let’s zoom in for a closer look for a shorter term observation. The downside very quickly erodes the progress. However, the asymmetric nature of losses starts to really compound against capital after -20%. At this point, the S&P 500 is down -18%. It’s a little lower than 2016 and about the same as the decline in 2011. Though this has been a very long bull market, it has been interrupted by deeper “corrections” of more than -10%. In comparison, the 2003 to 2007 bull market corrections were less than -10%. After prices have already fallen, I start looking for signs of a potential countertrend and divergence. The price trend itself is the final arbiter. It is what it is. A price that is trending down is going to continue to trend down until the desire to sell has been exhausted and drives prices low enough until the enthusiasm to buy takes over. After sharp selling pressure like we’ve seen since September, we’ll likely see some similarly sharp countertrend reversals up. Market trends don’t usually drift in a direction until it’s over, instead, we observe swings up and down as the price trend cycles. Short term cycles develop the longer term cycles. Though the price trend itself is the final arbiter, the best way I have identified when trends are most likely to change direction at extremes is to observe extremes in investor sentiment and breadth. Ultimately, investor sentiment and the breadth is evident in the price, but at extremes, these measures can be a warning shot across the bow at high levels and indicate panic selling exhaustion at lows. From here, we’ll look at investor sentiment measures. We’ll also look at breadth indicators that quantitatively tell us the breadth of participation in the decline. The thinking is at some point these measures reach an extreme, suggesting the selling may be becoming exhausted and to prepare for a potential reversal. Since asymmetric risk/reward is my objective, I’m looking for lower-risk entries that have the potential for greater payoff than the amount I risk. A simple way to quickly observe overall investor sentiment is the Fear & Greed index, which tracks seven different indicators. It’s the lowest level I’ve seen it, suggesting we’ve observed panic level selling. If you read my observations from the beginning of this year, you’ll see the opposite was true at the start of 2018. We’ve observed a round trip this year from Extreme Greed to Extreme Fear. Investor sentiment obviously swings up and down over time. As sentiment oscillates, it drives price tends to cycle, too. Even in bull markets, there are declines and in bear markets, we’ll see sharp upswings. When investor sentiment is so bearish we see a spike in the words “bear market.” Google Trends shows the bear market talk on the Internet has spiked to the highest level in five years, even higher than 2015-16 and February this year. I’m also hearing the typical talk about a 1987 type crash. The October 1987 -20% single day crash was 32 years ago but it’s still talked about today when prices fall. Markets are risky, so a crash is something we risk when we invest our money. The risk is partially why markets generate a return. We have to be willing to have exposure to risks that can come when no one expects it. Has modern market regulation and technology created any prevention of an ’87 type crash? Around 2012 circuit breakers were created to theoretically prevent a single day crash. Buy and hold, long-only asset allocation investors may take comfort in knowing there is some limit, but for those of us who actively manage our risk we prefer to deal with risk sooner if we can, but there is no assurance any strategy will always do as intended. You can read more about circuit breakers in Measures to Address Market Volatility. The bottom line is these circuit breakers are intended to limit a single day waterfall decline, they do not control overall drawdowns. How many stocks are participating in the decline? Another way to say it; How “washed out” is the stock market? To understand the internal condition, I look inside the indexes at the sectors and stocks. We’ll start with Breadth indicators, which quantitatively measure the percent of stocks in uptrends vs. downtrends. When 70% of stocks are already in uptrends it signals a strong market trend but also suggests as most stocks have caught up and participated, buying enthusiasm may be getting exhausted. When less than 30% of stocks are in uptrends, 70% of them are in downtrends, so the market trend is bearish. However, after most of the stocks have already fallen, at some point, it suggests we look for the exhaustion of selling pressure that could reverse the downtrend. The percent of the S&P 500 stocks above their moving averages tells us how many of the 500 stocks are in an uptrend vs. a downtrend. When it’s declining, the market is bearish so we can see how many stocks are participating in the decline. When it reaches an extreme low, it may be an indication selling could be becoming exhausted. As we see, it has reached the low levels of past stock market lows with the exception of the low in March 2009. Notice the low was reached October 2008 and stayed down until late March 2009. In the massive crash when stocks fell over -50%, it stayed “oversold” for over 6 months. It’s an example of the limitations of countertrend signals in outlier events. For a view of the short-term trends, I do the same for the 50 day moving average. Only 6% of the S&P 500 stocks are in uptrends, so 94% are in short-term downtrends. That’s the bad news for stock investors. The good news is, it’s reached the low range where we have historically seen a reversal up. A reversal up from here would be bullish, at least temporarily. The S&P 500 Bullish Percent Index is the number of stocks in the S&P that are trading on a Point & Figure buy signal. By this measure, only 17% of the 500 stocks are in uptrends. I highlighted the top are in red to note the contrary indicator of breadth and green on the bottom to mark the contrarian bullish zone where downtrends may reverse to uptrends when selling gets exhausted. The S&P 500 Bullish Percent Index is below 2011, 2015 and 2016 stock market correction lows. BPI is considered overbought when above 70% and oversold when below 30%. Once it reaches the green zone, I start looking for a reversal up from a low level, which is a bullish signal. Notice the current level is below the 2011 and 2015-16 decline, but not as low as the 2008-09 bear market when the stock index fell -56%. We see the same scenario in the NYSE Bullish Percent, which applies the same method to the stocks trading on the NYSE. We’re not seeing any divergence in the breadth indicators, they are all down as most stocks have fallen. These are now at the level to look for countertrend signals. The High-Low Index is a 10-day moving average of new highs vs. new lows. This breadth indicator shows when new highs outnumber new lows and when new highs are expanding. In general, new highs outnumber new lows when the indicator is above 50. New highs are expanding when the indicator is above 50 and rising. As with most range bound oscillator indicators, high is over 70 and low is below 30. Here we see it’s about as low as it has been. We also see how it can swing around for a year or two in a bear market. Since it can take time for prices to reach all-time highs and lows, the High-Low Index is more lagging than similar indicators. Before we look inside the sectors, we’ll look at some other indicators of sentiment. This week, the CBOE Total Put/Call Ratio spiked to 1.82, which is its highest put volume over call volume ratio ever. We have data going back to 1995. As you can see in the chart, we normally see this ratio less than one as more calls trade than puts. A reading over 1 is usually a signal of pessimism as options traders appear to buy buying put options for protection or to speculate the stock market will fall. We’ve never seen put volume so high. Options traders appear to be very bearish, which has historically been a contrarian indicator at some point. By the way, big bear markets unfold in cycles as the trend swings up and down. In the last bear market, the stock indexes fell -15%, then gained 10%, then fell 20%, then gained 15%, along the way you never know in advance which direction it is going to trend next. Many tactical traders had trouble with the 2007 to 2009 period because of whipsaws. By the time they exited, the market trended up without them, then they reentered just in time for the next fall. This is the risk of tactical trading, whether the method is breakouts, momentum, relative strength, or any other rotation style. I know this because I’ve known over 100 other tactical traders for over two decades. The price swings are the challenge. For example, below is the 2008 – 2009 -56% decline. As you can see, the Equity Put/Call Ratio is on top. I drew green lines at its peaks to show they typically indicate a short-term price low, but probably not as well as it would in a correction within a primary bull market. The point is, sometimes signals work out well, other times they don’t. They don’t have to be perfect and none are. The key is asymmetry: higher average profits than losses over full market cycles. One indicator showing some divergence is the VIX CBOE Volatility Index. Although the S&P 500 is about -5% lower than its February low when the VIX spiked up to nearly 40, the VIX is only at 30 this time. However, I point out it did the same thing in the lower low in January 2016. The VIX initially spiked more in the first decline in August 2015 but remained less evaluated at the lower low in January 2016. It appears the options market expects elevated volatility, but not as much as an expansion as before. We’ll see. Drilling down, what about sectors? Below are the individual sectors YTD. Energy and Materials are down the most. Ironically, they are tied to inflation. Where is the rising prices (inflation) the Fed is supposed to be fighting? To get an underatnding of the individual stock trends within a sector, I look at the bullish percent of the sectors. First, we’ll observe the bullish percent of the Energy sector. Energy is down the most and only 3% of stocks in the index is an uptrend as measured by a point & figure buy signal. It’s as low as its been in 20 years. Though it could stay at this low level in a bear market as it did around 2008, it still swings up and down for those willing to trade it. The next biggest loser sector is Basic Materials, another commodity-related sector. I highlighted the current low level in green, which is nearly as low as it’s ever been in 20 years. These indicators are range bound, so they can only fall to 0% and as high as 100%. The Financial sector is the third largest weight in the S&P 500 stock index at 13%. It’s down -18%, making it one of the biggest laggards. Banks, brokers, etc. are leading the market down and that isn’t a good sign for the economy of the market. Financials often lead in bear markets. However, as we see below, their participation in the fall is about as high as it’s ever been. On the other hand, we see how volatile and weak Financials were in 2007 to 2009. During that “Financial Crisis”, they were among the worst. The industrials sector, down about -18%, continues the trend of broad participation in the sell-off. It’s also reached the lowest it did in 2008 and 2011. Consumer Staples is a sector that is supposed to hold up in market declines, but the index is down -12% year to date, which is more than the S&P. Staples stocks have participated as much as they did in prior corrections in 2011 and 2016, but not as much as around 2008. The Technology sector is a big one because at 20% it has the largest weighting in the S&P 500. The Technology sector is down about -7% YTD. The Technolgy sector bullish percent is down below its lows in prior corrections and nearing the 2008 and 2009 lows. Keep in mind, once prices have moved to a low point, they eventually attract buying demand and reverse the other direction. These indicators help us see the levels it is more likely to happen and a reversal in these indicators increases the potential even more. Consumer Discretionary is 10% of the S&P and down -5% YTD. Its bullish percent is as about as low as it’s been. Another major sector is Healthcare, it’s the second largest weighting at 16% of the S&P 500. It’s flat for the year, but its bullish percent is very washed out. The Utility sector is the lone survivor so far in 2018. Like Consumer Staples, Utilities are considered “defensive.” That expectation hasn’t held true for Consumer Staples down -12% this year, but the Utility sector is up 2% YTD. The first half of the year, Utilities were laggard as they are sensitive to rising interest rates, but the last half they’ve found some buying interest. As we see, the Utility sector momentum has been strong enough to keep its stocks in uptrends and into the higher risk zone. However, notice they tend to stay at higher bullish percent levels over time. Utilities don’t usually have strong momentum against other sectors, but they do tend to have less volatility. Of course, in the last big bear market that wasn’t the case as everything fell. The bottom line is the stock market could certainly be entering another big bear market. It’s long overdue as this bull is very aged and overvalued. Even if it is, it will include swings up and down along the way. That’s the challenge for all strategies that trade or invest in stocks. For buy and hold investors, it’s a challenge as stocks swing up and down and they have full exposure all the time and unlimited downside risk. For tactical traders, the swings are a challenge as we increase and decrease our exposure to risk and reward and none of our methods are perfect. The key, for me, in dealing with it is to hold the lowest risk, highest potential reward exposure. Barring we don’t see some waterfall decline, most of the market is at a point we should see a countertrend move up at least temporarily. If prices keep trending down, I’m guessing the upswing that does come will be just as sharp. After prices have fallen, I start looking for signs of a potential countertrend and it could come at any time. Someday in the future, stock investors will be giddy again and completely forget about how they feel right now. But for now, the trend is down, but the sentiment and breadth are at such extremes we should be alert to see at least a short-term reversal in the days ahead. I hope you find this market analysis helpful. If you don’t believe it is exhaustive enough, I encourage you to read some of the other recent observations since they cover more detail on some of the topics above. After prices have fallen, I start looking for signs of a potential countertrend and divergence. If you want to be like Warren Buffett, you’re probably enjoying the recent rout in stocks. The U.S. stock market is now oversold based on short-term relative strength measures. Our 14 day RSI reading has declined to 28, which is at oversold levels that have historically signaled countertrend reversals up. The trouble is, market prices can reach oversold levels and just keep getting more oversold for a while. For example, when the S&P 500 declined -56% from October 9, 2007 to March 9, 2009 it got deeply oversold several times as the price trend cycled up and down. We can visually observe the Relative Strength Index spent more time in the lower range as prices were falling. Then in 2009 as prices finally trended up momentum stayed elevated. Another indication of an oversold condition I observed today is when we draw bands of ATR around the price trend to measure volatility expansion. ATR is the average true range of the price over the past 14 days, a short-term measure of range and volatility. When the prices spread out, so does the band as it indicates volatility expansion. Today the price of the S&P 500 declined below the band, so the recent price action on the downside is an outlier by this measure. As you can see, the last time the price traded below the volatility band was the February low. What this observation suggests is the price has moved down low enough that it’s a short-term outlier, so it should trend the other way (at least temporarily). Stock market breadth indicators measure the participation of a stock advance or decline. The percent of stocks above their 200 day moving average tells us how many stocks are still in longer-term uptrends vs. downtrends. After today, only 18% or 89 stocks are above their 200-day trend. It’s now down to the low level reached during the August 2015 to January 2016 lows. After it reached this low in 2016, stocks went on to trend up to a new all-time high. At this point, the S&P 500 and Dow Jones have declined -15% from their September high. If this is a cyclical “correction” within an ongoing bull market, we should see prices trend up soon and eventually trend to a higher high. However, even if this is the early stages of a bear market that declines over -20% or a big bear market like 2000-2003 and 2007-2009 that declines -50%, the stock market will still likely swing up and down along the way. As we saw in the above chart that included the last bear market, the stock indexes swing up and down 10% to 20% on their way down just as they do on their way up. Some of these swings can be traded, some not so well. This recent decline since September was probably more challenging for tactical traders. Though the stock market got overbought enough in September to signal reducing exposure near the high, after prices fell to a lower level and signaled a countertrend entry, the price trend has since kept falling. But, at this point, countertrend systems now have a stronger entry signal than before. The challenge with countertrends is a trend can always continue trending farther. That is, oversold can get more oversold until sellers have been exhausted and buyers are attracted by the lower prices. Prices keep trending until the supply and demand shifts direction. The bottom line is the broad stock indexes are trending up and led by a few strong sectors, but they’ve reached levels that my countertrend momentum systems suggest the risk of at least a temporary decline is elevated. Because of this, I reduced my exposure to only 70% long stocks around the September high. However, we still participated in the October rout more than I planned because the 30 % of stocks we held that were former leaders declined the most. I then started adding exposure to stocks at lower prices and so far, they’ve only trended lower. Everything is always probabilistic, never a sure thing. Anytime we see stock prices decline more than -10% the narrative we hear in the media changes from “correction” to speculation of a “bear market”. As I mentioned a few days ago, this is the longest bull market in U.S. history and the second highest valuation. As such, anything can happen. However, at this point, this decline of -15% is around the range of the 2015-16 decline and the 2011 decline. Here is what the August 2015 to January 2016 declines looked like. In 2011, the correction was the deepest we’ve seen since this bull market started in March 2009. To put it all in context of a major bear market like the last one 2007 to 2009 when the stock index declined -56% over two years and took another four years to return to its 2007 high, I marked -15% green. The stock market was already down -15% from its October 2007 high by January 2008 – two months later. The bear market had many countertrend swings back up giving many who were holding some hope, but it ultimately cycled its way down to cut stock portfolio values in half. Many say they are “long-term investors.” The long-term investors who buy and hold stocks or the stock indexes have to be willing to hold through an astonishing loss like -50%. I am not willing to hold on to losing positions near that long or let my losses get that large. But even for a tactical portfolio manager like myself, I have to be willing to expose our capital to risk and endure some drawdowns. I just choose to limit my drawdowns by predefining risk through my exits and/or hedging. I prefer to avoid the price action below the green line in the chart above. This has been one of the worst ends of the year in history. In fact, as of now, this is the 2nd worst December in S&P 500 history. It is the worst in MSCI World global stock index history. The only good news I can share is the stock market has reached an oversold level based on short-term momentum and investor sentiment measures are at extreme bearish levels. Both are contrary indicators. These indicators normally signal a reversal back up at some point. Although, if enough investors wish they had sold, they may sell as prices trend up, so the trend could swing around for a while. It means volatility may continue for some time. Todays AAII Investor Sentiment Survey shows optimism and pessimism remain outside their typical ranges: bullish sentiment is unusually low and bearish is unusually high. Historically, both have been followed by higher-than-median six- and 12-month returns for the S&P 500 index, particularly unusually low optimism. Again, this is a contrary indicator as investors as a crowd tend to feel the wrong feeling at the wrong time at extremes. The fear and greed index that measures investor sentiment using multipe indicators is down to five, which is about the most extreme fear level it’s ever been. One of the indicators in the Fear and Greed Index is the Put/Call Ratio is used as a contrarian indicator to gauge bullish and bearish extremes. The sentiment is considered excessively bearish when the Put/Call Ratio is trading at relatively high levels. One a normal day, the Put/Call Ratio is less than one since options traders tend to trade calls more than puts. Today the Put/Call Ratio is at 1.82, so options traders are buying many more puts for protection against a market decline or as a directional bet. Put/Call Ratio is at 182% is an extremely high level, the highest ever recorded. The Put/Call Ratio data goes back to 1995 and 1.2 has historically been an extreme high. The bottom line is, fear of lower prices is driving the stock market, and the bears have been in control. However, sentiment has reached such an extreme we would expect to see a countertrend reversal up at least temporarily. Even if this is the early stage of a lower low and a bear market, it will include many swings up and down along the way. What the trend does once it finally drifts up will be telling of the bigger picture. Bear and bull markets are both a process, not an event. In a bear market, prices trend up down to lower lows and lower highs. The swings along the way result in fear of missing out and the fear of losing more money which leads to overbought and oversold conditions. I believe risk must be actively managed through increasing and decreasing exposure to the possibility of loss because markets are risky. The stock market can decline -50% or more and take years to trend back up, so I believe drawdown controls are necessary to preserve capital rather than allowing losses to get too large. Once a portfolio declines more than -20%, the losses grow exponentially and become harder to recover. We’ll see how it all plays out. We’re still waiting to see those investors who are “greedy when others are fearful” overwhelm the sellers enough to change the trend. I don’t always share when I observe stock market patterns unfold, but when I do, it’s usually to inform (or aggravate) my friends who don’t understand (or want to understand) technical analysis. Long before I started developing computerized trading systems based on quantitative signals I learned and applied chart patterns and trend lines to determine if a trend was up, down, or sideways. Said another way, up until 15 years ago I identified the direction of price trends visually looking at a price trend on a chart. I later defined up, down, and sideways with mathematical equations that help to systematize the process of trend identification. I believe my starting out learning trends by hand and visual representation helped me to develop better quantitative trend systems. The two go hand in hand. We can define the direction of a trend with an equation as simple as momentum. For example, I have 14 different definitions of momentum and equations that define it. A simple one is X period rate of change. If it’s positive, the trend is up. If it’s negative, the trend is down. The factor that determines the trend direction is the time frame. Many academic types like using simple time series momentum methods like this because it’s easy to backtest. Pattern recognition is more difficult, so fewer have developed systems to automate pattern recognition and make it testable. Chart patterns have historically been more visual. Chartists or technical analysts look at the chart of a price trend to determine if there is a pattern. The pattern we are looking for tells the story of supply and demand. The chart of a price trend shows us what has been going on with the battle between supply and demand from buyers and sellers. We may get an idea of who may be winning the battle and position our capital in that direction. For example, when prices are rising the buyers are in control and when prices all falling selling pressure is dominant. So, pattern recognition is just another form of trend following. Instead of using X-day breakouts, moving average, or channel breakouts, it’s using a pattern that is believed to tell the story of price action. We don’t make decisions based on a pattern, but the underlying asymmetry between buyers and sellers that caused the pattern and the direction of the price trend. To me, it’s a much more simple way to determine if buyers or sellers are in control of the price trend than trying to find a fundamental narrative. There are so many different reasons for buying demand and selling pressure we could never really know why one is dominating the other. The news attempts to explain it, but the truth is, investors could be buying or selling based on perceived fundamentals, trend lines, moving averages, stop losses, buy stops, fear of missing out, fear of losing money, or tax reasons. Rather than trying to figure out what the majority is thinking, the pattern of the price trend tells the net result of all the buying and selling. It fits the idea of simple beats complex and if we simply stay with the direction of the trend we can’t be too wrong for too long. Someone making decisions based on things other than the price trend itself has the potential to stray far away from the reality of the price. To me, chart patterns are really just a little more elaborate versions of trend lines. A trend line is just a line marking a chart such as how I marked the higher highs and higher lows yesterday in Divergence in the Advance-Decline Line May be Bullish. I observed today the S&P 500 seems to be forming a head and shoulders bottom pattern. The head and shoulders pattern happens when a market trend is in the process of reversal either from a bullish or bearish trend. There are two kinds of head and shoulders. A head and shoulders top is a pattern that forms after an uptrend. After it is completed, it signals a reversal of the trend from up to down. A head and shoulders bottom is an inverse of the head and shoulders top. The head and shoulders bottom forms after a downtrend and signals a change of trend from down to up. Below is the chart of a theoretical index used to represent an idealized head and shoulders. It includes both head and shoulders tops and head and shoulders bottoms. Stockcharts offers this index for educational purposes to see what idealized head and shoulders look like. You may notice each top and bottom are a little different – they aren’t perfect. I put the green box around a head and shoulders bottom. You can see why when you look at the S&P 500 stock index chart below. An inverse head and shoulders pattern is simply a downtrend caused by selling pressure, interrupted by a brief reversal (left shoulder), a selling climax (head), an interruption again (right shoulder), then it would move on to new highs. Moving on to new highs will determine if it is completed as a reversal bottom, or not. To reverse the downtrend, selling pressure must be exhausted as buying demand becomes dominant. Many patterns like the head and shoulders rely on volume as confirmation, so chartists can make it as complicated as they want, or keep it simple by looking at the pattern. For my purpose, I’m going to keep it simple and say we’ll know if this is indeed a head and shoulders bottom reversal pattern if it follows through on the upside. If it does, we would expect the price trend of this index to at least reach its old highs. If the price doesn’t hold and it doesn’t follow through to the upside, it’s probably going to at least test the prior low again. Either way, patterns are never completely accurate. It’s probabilistic, never a sure thing. The head and shoulders is simply a pattern formation commonly seen after a downtrend that, if completed, may signal the end of the downtrend and reversal into a new uptrend. It’s based on the visual representation of the battle between supply (selling pressure) and demand (buying interest). For example, when the head and shoulders bottom completes the low point in the (inverse) head, it marks the point when those who wanted to sell have sold. So, the right (inverse) shoulder signals selling has dried up and buyers are taking over. It is completely normal to observe profit-taking after an advance, so the last few days is normal even if this is a reversal up. You can probably see how volume gets involved to confirm the pattern. In the case recently, the volume was high at the lows signaling selling pressure. The volume is declining on the right shoulder. The good news is, the volume didn’t expand on these recent down days. Let’s see how it all unfolds. 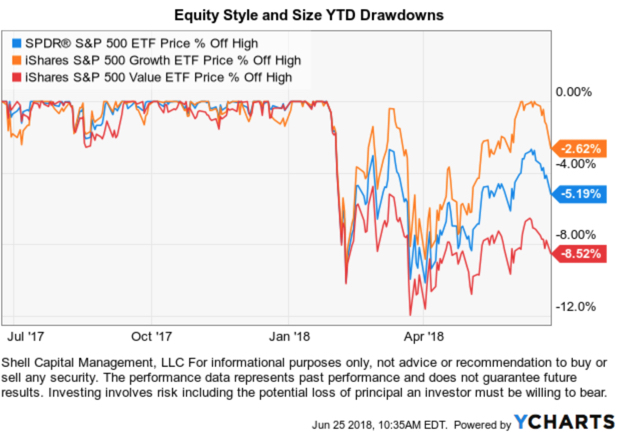 With the stock market swinging up and down with the volatility expansion we’ve seen since February many investors are probably wondering which way stocks are going to trend. Individual investors should be aware of the big picture. The primary trend has been up since March 2009 with several declines interrupting it along the way. In fact, there have been eight declines more than -10% and three of them were between -15% and -20%. But, none have been over -20%, which is the level most define as a “bear market”. So, this is the longest bull market in U.S. stocks in history. Many investors may realize that trends cycle up and down and when a trend moves longer or farther than normal, they may be expected to swing the other way longer and farther. For this reason, the intelligent investor is probably on alert for signs of the beginning of a change in the primary trend from a bull market to a bear market. Market cycles aren’t just the longer primary trends, they are made up of many smaller trends that may be tradeable swings up and down. Avoiding a large bear market isn’t as simple as predicting it and then exiting the stock market until it’s over. We never know for sure in advance when a primary trend shifts from positive to negative and back to positive. In the real world, we focus on shorter time frames and have to deal with the short-term price swings that happen as a trend unfolds. Despite the recent volatility and the down days, at this point, the U.S. stock market primary trend remains up. We say that because this two-year chart shows higher highs and higher lows. For that to change, we would need to see the stock index decline and stay below the prior lows. Of course, that is a possibility, but those who are following the trends respond to the actual change of trend. One positive confirming indicator is improving breadth during the recent swing up from the October low. The Advance-Decline Line is a breadth indicator that indicates the level participation of the stocks in an index like the S&P 500. For example, a broad advance shows the internal strength that is lifting most boats, which is bullish. A narrow advance would show a mixed market that is selective instead of broad participation. So far, we’ve seen the S&P 500 Advance-Decline Line make a higher high in the upswing, even though the S&P 500 index itself has declined the past few days. One of the characteristics of the Advance-Decline Line is that it treats all 500 stocks the same, giving them equal weight. The standard S&P 500 stock index that investors track is a capitalization-weighted index that weights the largest stocks in the index much more heavily. Since the Advance-Decline Line gives each of the 500 stocks equal power, it emphasizes small and mid-cap stocks more. To get a more accurate view of the Advance-Decline Line relative to the stock index, we can use the S&P 500 Equal Weighted Index. I included it below. As we see, the equal-weighted stock index has trended up more similar to the Advance-Decline Line – and both of them made a higher high. We continue to observe a much more volatile market condition than we saw in 2017. That should be no surprise since the CBOE Volatility Index indicates implied volatility has been elevated as we’ve seen this volatility expansion. However, it’s at 20 today, which is its long-term average. Looking back over two years, the next chart shows how much more elevated implied volatility was over last year. Volatility is mean reverting, which means volatility tends to swing from higher states to lower states. Although the VIX long-term average is 20, it rarely stays at that level. Instead, it swings up and down. 2018 has been a volatile year for stocks by any measure, but it may seem even more volatile since 2017 was so quiet. So far in 2018, the S&P 500 stock index has been down -1% or more on 21 days. In 2017, stocks only had a -1% or more down day 4 days the whole year. By that measure, does it make 2018 a volatile year? Or 2017 a calm year? By this measure, 2017 was an unusually calm year for U.S. stocks. 2018 isn’t a lot different than 2015 and 2016. Individual down days don’t make a trend unless you are a day trader, which we are not. We measure market risk by actual drawdown. Below is a chart of the drawdowns for the stock index year to date. The S&P 500 has declined -10% twice. A -10% within a year is normal, along with a couple of -5% drops. But, two -10% declines in a 12 month period isn’t all that abnormal, either. One thing that may make the price trend swings and volatility seem unusual this year was the lack of it last year. Below is last year, when we didn’t see any drops more than -4%. Markets cycle and swing up and down over time, and so does volatility. At this point, we are observing an overall primary uptrend in U.S. stocks but the shorter-trend trend this year has shown us broader swings of +/- 10% or so as volatility has expanded and price swings have spread out. Despite the down days Friday and today, the short term trend is relatively positive with positive participation as measured by the Advance-Decline Line. Only time will tell how it all plays out from here. Trying not to sound like a broken record, I’ll share a few updates from what I said last in Observations of the stock market downtrend. The stock market is at an inflection point. An inflection point is a time of meaningful change in a situation; a turning point. The reality is, there are many inflection points within market cycles and price trends. So, we observe different inflection points across different time frames. For those who watch the stock market daily as a professional portfolio manager, we observe every move. But, the overall focus needs to be on the bigger trends. Every market cycle and price trend is made up of smaller cycles as prices swing up and down on their way to forming a directional trend. Market cycles don’t trend straight up or down. The U.S stock indexes have dropped about -10% in October, giving up gains for the year. Many investors probably believe October is historically the worst month of the year for the stock market because of famous October declines. September is actually the worst month historically, but October is historically a volatile month. It just so happens, this decline occurred inside of October. I don’t use seasonality as a signal for my decisions, but we’ve all heard of “sell in May and go away.” The period from May through October is supposed to be the weak season and November to April is the stronger season for stocks. 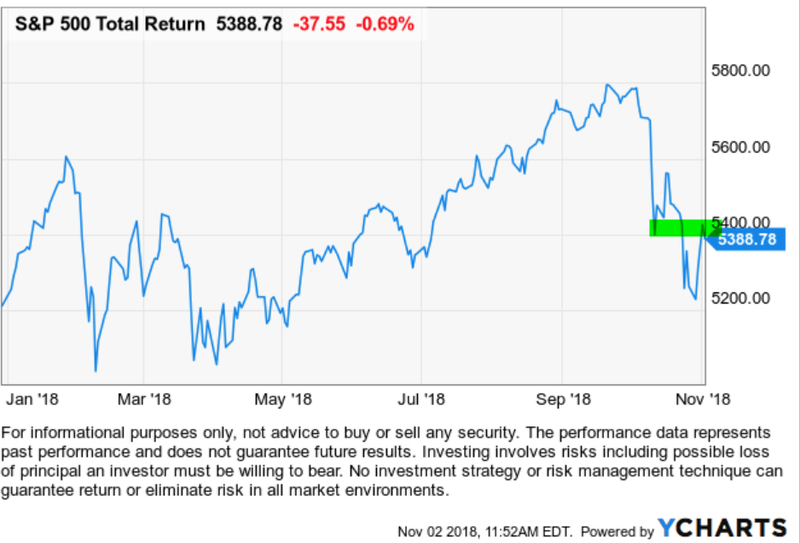 The S&P 500 had defied the expectation that stocks would be weak last summer and gained nearly 10% from May through September, then lost the gain in October. Many leading growth stocks that previously showed the strongest momentum declined even more than the stock indexes. I pointed out a few months ago that international stock indexes including both emerging and developed countries were already in downtrends. So, the global equity markets were generally down in October. That’s the bad news for anyone invested in these markets. The good news is after those who wanted to sell have sold, prices eventually reach a low enough point to attract new buying interest. I focus on what the price trends are actually doing, so I’ll share my observations of the trends and update some sentiment and breadth indicators I’ve discussed in previous observations. First, we look at what the price trend is actually doing. Below is the S&P 500 stock index year-to-date. We see after declining about -10% from its September high, the stock index has reversed back up to the price of the prior low on October 11th. In technical analysis of price trends, we say “prior support may become resistance” and that may be what happens next. We shouldn’t expect prices to trend straight up or down, they swing up and down. Prices making higher highs and higher lows form uptrends or lower lows and lower highs form downtrends. So, it wouldn’t be abnormal to see the stock index trend back down to the low again, or it could pause and continue the recent upward direction. For a sustained move higher, those who want to sell need to have sold and prices need to have reached a low enough point to attract new buying demand. Have those who want to sell, sold? To get an idea for observation of investor sentiment, we can look at a few simple indicators. I explained the thinking behind the Fear & Greed Index in Observations of the stock market downtrend. The Fear & Greed Index is based on 7 indicators of investors sentiment and can be a useful gauge to help investors keep their own sentiment in check. It currently remains at an “Extreme Fear” level, which is typical after a stock market decline and a high level of bearish sentiment that has historically preceded stock prices reversing back up- as those who want to sell have sold. However, in a prolonged bear market, this oscillating indicator could stay low for a long time or it could swing up and down along with price trends. But, nothing illustrates buying and selling, supply and demand, better than the actual price trends. Another interesting indicator I’ve shared in recent observations is the percent of stocks in the S&P 500 that are trading above their short-term moving average. It shows us how many stocks have participated in an uptrend or downtrend. When it reaches a high point and most stocks have participated in an uptrend, it may be nearer a reversal back down. Price trends don’t move straight up. When it reaches a low level is indicates most stocks have declined and at an extreme, it can suggest capitulation – those who want to sell may have sold. But, prices don’t trend straight down. Prices swing up and down along the way to drifting directionally. At this point, this indicator has reached the February and April lows and reversed up. Shorter term, it’s an inflection point as I highlighted. If more stocks trend back up, we’ll see this trend higher. In summary, today was a strong upward momentum day for the stock market and most stocks participated in the uptrend. After sharp declines like we’ve seen this month, the stock market sometimes reverses up like this into an uptrend only to reverse back down to test the low. After the test, we then find out if it breaks down or breaks out. One day doesn’t make a trend, but for those who are in risk taker mode with stocks, so far, so good. The part I bolded with italics has turned out to be the situation this time. Below is a year to date price trend of the S&P 500 stock index. As of today, my observation “the stock market sometimes reverses up like this into an uptrend only to reverse back down to test the low” is what we are seeing now. The positive news is, investor sentiment measures are reaching levels that often precede short-term trend reversals back up. The bad news is if the current trend becomes a bigger downtrend these indicators will just stay at extremes as long as they want. We have to actively manage our exposure to loss if we want to avoid large losses, like those -20% or more that are harder to overcome. Down -10% is one thing, down -20% is another. Any investor should be willing to bear -10% because they will see them many times over the years. Only the most passive buy and hold investors are willing to bear the big losses, which I define as -20% or more. Nevertheless, I see some good news and bad, so here it is. I’ll share my observations of the weight of the evidence by looking at relatively simple market indicators. I don’t necessarily make my tactical decisions based on this, but it is instead “market analysis” to get an idea of what is going on. Observations like this are intended to view the conditions of the markets. Fear is the dominant driver. 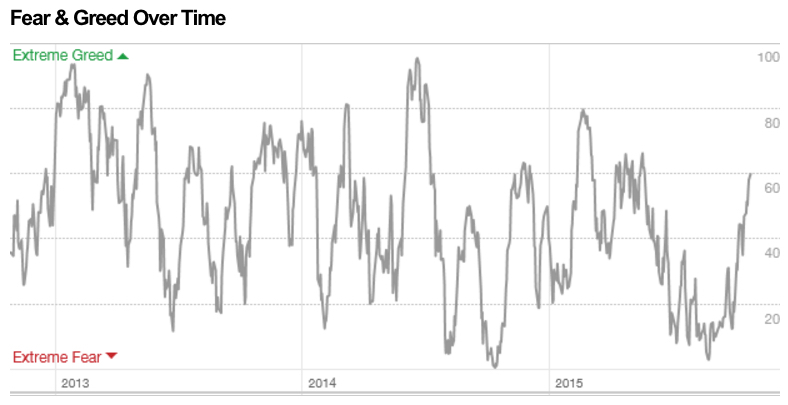 The Fear & Greed Index tracks seven indicators of investor sentiment. When I included it a week ago, it was at 15, which is still in the “Extreme Fear” zone. The theory is, the weighting of these seven indicators of investor sentiment signals when fear or greed is driving the market. Clearly, fear is the dominant driver right now. At this point, we can see investor sentiment by this measure has now reached the low level of its historical range. In this chart, we can see how investor sentiment oscillates between fear and greed over time in cycles much like the stock market cycles up and down. I believe investor behavior is both a driver of price trends, but investors also respond to price trends. After prices rise, investors get more optimistic as they extrapolate the recent gains into the future expecting the gains to continue. After prices fall, investors fear losing more money as they extrapolate the recent losses into the future expecting them to get worse. Investor sentiment and price trends can overreact to the upside and downside and the herd of investors seems to get it wrong when they reach an extreme. We observe when these kinds of indicators reach extremes, these cycles are more likely to reverse. It is never a sure thing, but the probabilities increase the possibility of a reversal. But, since there is always a chance of a trend continuing longer in time and more in magnitude, it is certainly uncertain. Since there is always a chance of a bad outcome, I have my limits on our exposure to risk with predetermined exits or a hedge. I started pointing out my observation several weeks ago of a potential volatility expansion. If you want to read about it, most of the past few weeks observations have included comments about the VIX volatility index. Over the past few days, we’ve observed a continuation in the volatility expansion. Implied volatility has expanded nearly 100% over in the past 30 days. As a tactical portfolio manager, my first focus is risk management. When I believe I have defined my risk of loss, I become willing to shift from risk manager to risk taker. I share that because I want to point out the potential for hedging with volatility. Rather than a detailed exhaustive rigorous 50-page paper, I’m going to keep it succinct. My day job isn’t to write or talk about the markets. I’m a professional portfolio manager, so my priority is to make trading and investment decisions as a tactical investment manager. I’m a risk manager and risk taker. If I never take any risk, I wouldn’t have any to manage. The observations I share here are just educational, for those who want to follow along and get an idea of how I see things. I hope you find it helpful or at least interesting. It’s always fun when it starts new conversations. To keep the concept of hedging short and to the point for my purpose today, I’ll just share a simple chart of the price trend of the stock index and the volatility index over the past 30 days. The stock index has declined -8.3% as the implied volatility index expanded over 95%. You can probably see the potential for a hedge. However, it isn’t so simple, because these are just indexes and we can’t buy or sell the VIX index. The purpose of a hedge is to shift the risk of loss from one thing to another. The surest way to reduce the possibility of loss is to simply sell to reduce exposure in the thing that is the risk. That’s what I do most of the time. For example, when I observed a potential volatility expansion, I reduced my exposure to positions that had the possibility of loss due to increased volatility. Once prices fall and volatility contracts, maybe we increase exposure again to shift back to risk-taking. If we take no risk at all, we would have no potential for a capital gain. So, tactical portfolio management is about increasing and decreasing exposure to the possibility of gain and loss. If we do it well, we create the kind of asymmetric risk/reward I aim for. So, any hedging we may do is really just shifting from one risk to another, hoping to offset the original risk. Keep in mind, as I see it, a risk is the possibility of loss. I’ll share more on hedging soon. I have some observations about hedging and hedge systems you may find interesting. Most stocks are participating in the downtrend. Below is an updated chart of the percent of the stocks in the S&P 500 that are above their 50-day moving average. If you want to know more about what it is, read the last observations. The simple observation here is that most stocks are declining. Much like how we saw investor sentiment cycle and swing up and down, we also see this breadth indicator oscillate from higher risk levels to lower risk levels. After most stocks are already in uptrends, I believe the risk is higher that we’ll see it reverse. After most stocks have already declined into downtrends, it increases the possibility that selling pressure may be getting closer to exhaustion. The good news is, at some point selling pressure does get exhausted as those who want to sell have sold and prices reach a low enough level to bring in new buying demand. That’s what stock investors are waiting for now. These are my observations. I don’t have a crystal ball, nor does anyone. I just predetermine my risk levels in advance and monitor, direct, and control risk through my exits/hedging how much I’m willing to risk, or not. We’ll just have to see how it all unfolds in the days and weeks ahead. Only time will tell if this is the early stage of a bigger deeper downtrend or just another correction within the primary trend. I hope you find my observations interesting and informative. The good news is, we’ve now experienced some volatility expansion, stocks have now pivoted down to the lower end of their cycles, so maybe volatility will contract and stock prices resume their uptrend. The U. S. stock market gains were broad across all sectors. 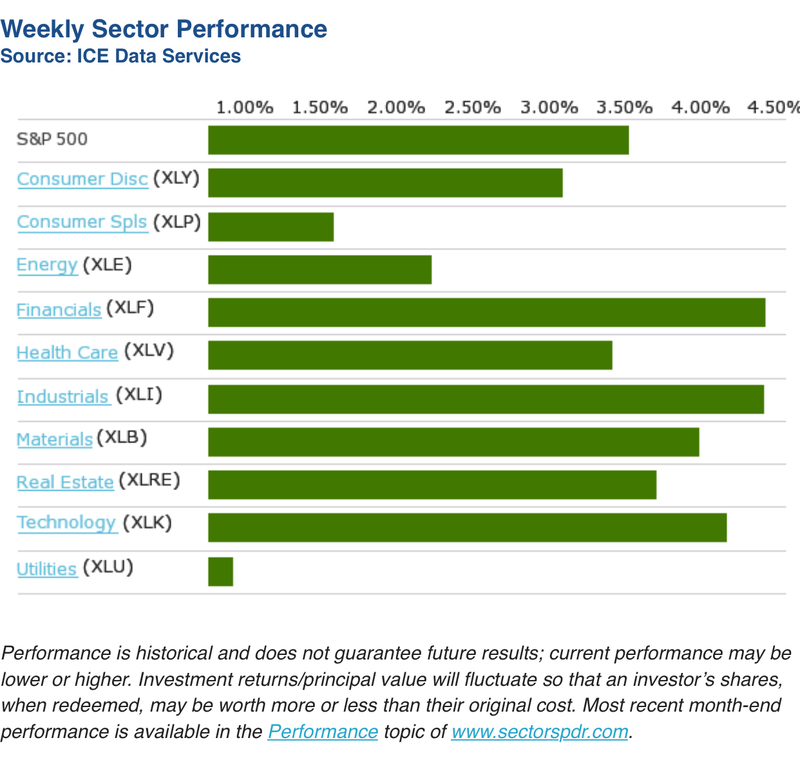 Communication Services, Consumer Discretionary, Healthcare, and Technology were the relative momentum leaders. Continuing with the % of S&P 500 stocks above their 50 day moving average as breadth indicator was another indication of broad upward momentum. 86% more stocks are trading above their shorter-term trend, an expansion from a low level. For those of us who like to enter trends early in their stage, this is a positive sign of improvement for the stock market. We observe the same in the percent of stocks trending back above their longer-term trends. There was a 16% expansion in the stocks in the S&P 500 index trending above their 200 day moving average. The longer-term trend indicators are slower to respond, but this is more evidence of positive directional movement. This is happening at a time when many investor sentiment indicators suggest fear has been driving stocks recently. A simple example is the Fear & Greed Index, which reached “Extreme Fear” a week ago. As a portfolio manager for the past two decades, I have observed investor sentiment oscillate between fear and greed, but as a contrarian pendulum. Most investors feel the wrong feeling at the wrong time. What happens, though, is market trends move in multiple time frames of cycles up and down. Prices can overreact to the upside and downside and the majority of investors seem to get it wrong. The level and direction of implied volatility is an indication of investor sentiment. I’ve shared my observations of the volatility expansion and noted some volatility contraction yesterday. So far, the volatility expansion has reversed to contraction, so the expected volatility as implied by options prices now suggests the market expects lower volatility in the weeks ahead. But, just as I pointed out on September 25th in VIX level shows market’s expectation of future volatility implied volatility can get it wrong. I pointed out then the implied volatility was very low signaling to me the market may have been wrong to expect such low future volatility, so it can reverse back up again. Yesterday I shared my observations of the overall stock market in The Stock Market Trend. Here are my observations of U. S. Sector trends to see which sectors are trending, which sectors have experienced declining momentum, and where they are year-to-date. Keep in mind, I use the actual index ETFs for observations since they represent real-world price trends including expenses, none of this is advice to buy or sell any of them for anyone. Below are the sector trends year-to-date. Ok, I know that looks like a hurricane spaghetti chart to show potential cyclone paths, so here is a table showing the year-to-date price trends using the Select Sector SPDRs. In 2018, Healthcare, Consumer Discretionary, and Technology are still the leading sectors. I’ll point out the divergence with sectors like Basic Materials and Consumer Staples lagging in relative momentum. A more interesting view is a visual observation of drawdowns year to date and recently. Here, we see that Basic Materials, Communication Services, Financials, and Consumer Staples are down over -10% from their highs. For a stock market decline to stop and reverse, it has to reach a low enough point to attract enough buying demand to support higher prices. The good news is the stock indexes, and many of these sectors are testing their longer-term trend lines. At the same time, they are reaching a point we could see at least a short-term reversal up from here. Only time will tell if the recent price declines are just a correction in an ongoing uptrend in the U. S. stock market or the beginning of a more significant downtrend. As a portfolio manager, I am a risk manager and risk taker. The only way to create gains is to take some risk. The way to manage risk is to predefine how much I’m willing to lose in advance. My focus is on asymmetric risk/return. So, my objective is to take a risk when it is more likely to result in positive asymmetry. Risk manager: decide in advance at what price to exit as a declining trend to manage the size of the loss. Determine how much of our portfolio we are willing to lose to see if price trends will become profitable. Risk taker: decide when to enter a position to take that predefined risk to see if the potentially profitable trend unfolds in our favor to become a profit. You can probably see how these market cycles and trends create both the potential for risks and rewards and we can decide how to tactically operate with them. 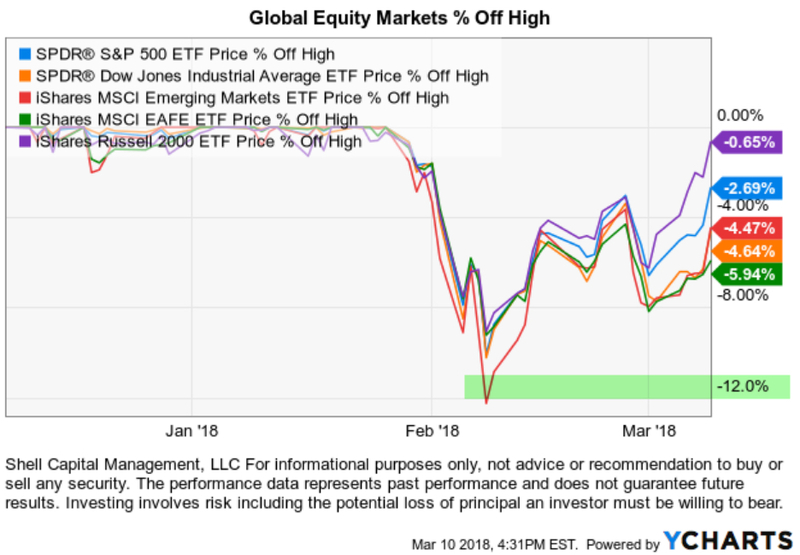 After a sharp decline in stock prices in February that seemed to shock many investors who had become complacent, the stock market indexes have been trying to recover. At this point, the popular S&P 500 has gained 1.75% year-to-date and the Dow Jones Industrial Average is down -2.56%. I also included the Total Stock Market ETF, which tracks an index that represents approximately 98% of the investable US equity market. Though it holds over five times more stocks than the 500 in the S&P 500 SPY, it is tracking it closely. The Dow Jones Industrial Average was the momentum leader last year, but the recent price action has driven it to converge with the other stock indexes. Past performance doesn’t always persist into the future. What is more interesting, however, is the divergence at the size, style, and sector level. The research firm Morningstar created the equity “Style Box.” The Morningstar Style Box is a nine-square grid that provides a graphical representation of the “investment style” of stocks and mutual funds. For stocks and stock funds, it classifies securities according to market capitalization (the vertical axis) and growth and value factors (the horizontal axis). The vertical axis of the style box graphs market capitalization and is divided into three company-size indicators: large, medium and small. The horizontal axis seeks to represent stock funds/indexes by value, growth, and blend which represents a combination of both value and growth. Looking at their distinct trends, we observe a material divergence this year. As we see below, the S&P 500 Growth Index ETF has gained 16.45% % over the past 12 months, which is triple the S&P 500 Value ETF. So, Growth is clearly exhibiting stronger momentum than value over the past year. But, notice that wasn’t the case before the February decline when Growth, Value, and Blend were all tracking close to each other. Year to date, the divergence is more clear. Growth is positive, the blended S&P 500 stock index is flat, and Value is negative. Showing only the price trend change over the period isn’t complete without observing the path it took to get there, so I’ve included the drawdown chart below. Here, we see these indexes declined about -10% to as much as -12% for the Value index. The Value index declined the most, which requires more of a gain to make up for the decline. The Value ETF hasn’t recovered as well as the others. To look even closer, we can get more specific into the style and size categories. 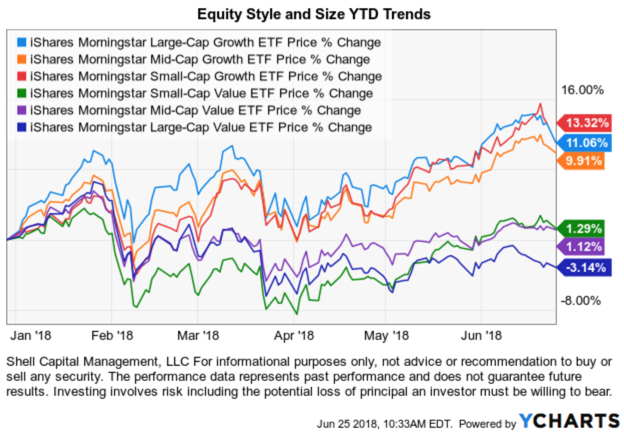 Below we show the individual Morningstar ETFs that separate the stock market into the Large, Mid, and Small size stocks and then into Growth vs. Value. All three at the top are Growth. The three at the bottom are Value. So, the divergence this year isn’t so much Large vs. Small cap, it’s Growth vs. Value. Clearly, Growth stocks are leading the stock market so far in 2018. Why do we care about such divergence? When there exists more difference between price trends, it provides more opportunity to capture the positive direction and avoid the negative trend if it continues. In part 2, we’ll discuss how sector exposure is the primary driver of style/size returns. The enthusiasm to sell overwhelmed the desire to buy. The S&P 500 stock index closed down -1.42% today. Stocks trended down most of the day and at 2:35pm it was down -2%. As you can see on the chart, it reversed up in the last 90 minutes and closed with positive directional movement. It almost closed above its Volume Weighted Average Price (VWAP). There are many notable economic reports out this week, so maybe investors are concerned about to the jobs report and the Fed FOMC Meeting. The options market has priced in a 94% chance of a rate hike, so it shouldn’t be a surprise. But, this week is the first FOMC meeting for the new Chairman Powell. Implied volatility in recent weeks is one of many signals that suggest a volatility regime change. 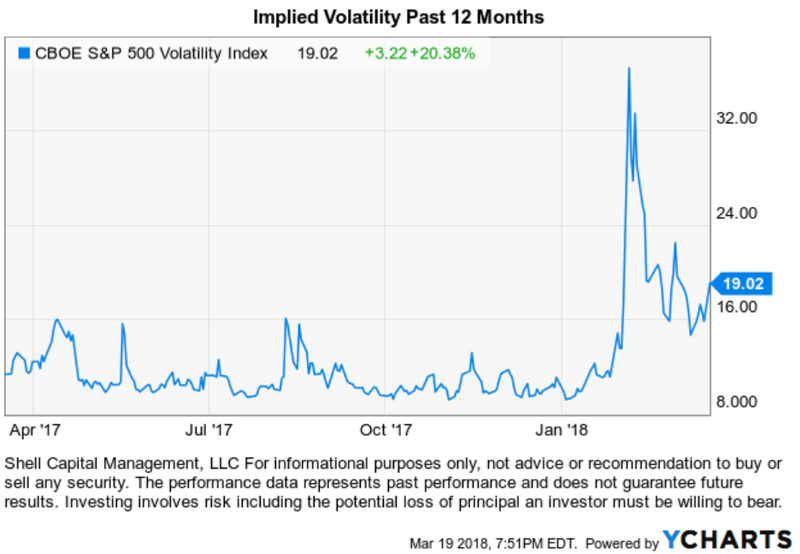 The CBOE Volatility Index® (VIX® Index®) is a key measure of market expectations of near-term volatility conveyed by S&P 500 stock index option prices. The VIX® doesn’t seem to want to go back to those prior low levels, so the expectation is higher volatlity. At this point, the decline today was nothing too abnormal. The stock index is -3.% off it’s high a few weeks ago and -5.4% off its all-time high. However, as you can see below it is within a normal trading range. Speaking of trading range, notice the bands of realized volatility I added to the chart are drifting sideways rather than trending up or down. I see higher lows, but equal highs in the most recent trend and lower highs looking back to January. The VIX is expected volatility, the blue bands are realized volatility. My systems define this as a non-trending market. When I factor in how the range of price movement has spread out more than double what it was, I call it a non-trending volatile condition. It is useful for me to identify the market regime because different trend systems have different results based on the situation. For example, non-trending volatile market conditions can be hostile situations for both passive and trend following strategies. However, countertrend systems like the swings of a non-trending volatile market. Trend following systems thrive in markets that are trending and smooth. When a market is trending and smooth, the trend following system can earn gains without having to deal with significant adverse price action. When a market trend shifts to non-trending and volatile, the trend following signals can result in whipsaws. A whipsaw is when the price was moving in one direction (and the trend follower buys) but then quickly reverses in the opposite direction (and maybe the trend follower exits with a loss). Even if the trend following system doesn’t enter and exit with a loss, in a non-trending volatile market the trend follower has to deal with the same hostile conditions as a passive investor as the market swings up and down. My U. S. equity exposure since early February has come from my shorter term countertrend systems. My focus and the focus of my systems isn’t to predict the direction of markets but instead to identify when a market is undergoing a regime change or shifts to a distinct environment. I don’t analyze the markets to try to predict what it will do next. I look at what the market is actually doing and react to it. The is no guarantee that any strategy will meet its objective. Past performance is no guarantee of future results. In my portfolio management, I primarily want to identify trends and get positioned with that trend. As long as there is uncertainty, we’ll see trends. Investor sentiment and expectations underreact to information causing the price to adjust gradually and that’s what produces a trend. The trend following systems I wrote about in My Introduction to Trend Following are designed to buy an asset when its price trend goes up, and sell when its trend goes down, expecting price movements to continue. We also see the overreaction of investor sentiment and their expectations. After price keeps rising, investors may become overly enthusiastic, which causes prices to overreact and move up to an extreme that matches their sentiment. We saw that the last part of 2017 and it continued in January. We say these markets have become “overbought” and mathematical indicators can signal a countertrend. We also sometimes see investor sentiment and their expectations plunge as they panic when prices are falling. We say these markets have become “oversold” and mathematical indicators can signal a countertrend. Looking back over the past two months, we may have seen an overreaction on the upside, then an overreaction on the downside. I say that because the stock market very quickly dropped -10%, then recovered most of it a few weeks later. Someone asked recently “Do you invest and trade in all ETFs and stocks using the same trend system?” The answer is “not necessarily.” As I described above, trend following and countertrend systems are very different. Trend following systems can be multiple time frames, but usually longer trends of at least several months to years. Countertrend moves are normally shorter term as a market may get overbought or oversold, but it doesn’t usually stay that way a long time. For example, the S&P 500 was overbought the last few months of 2017 and that was an anomaly. It was one of the most overbought periods we’ve seen in the stock indexes. So, it was no surprise to see a fast -10% decline. My point is, different trend systems can be applied to markets. Both trend following and countertrend are trend systems, they just intend to capitalize on a different trend in behavior – overreaction or underreaction. When I apply my countertrend systems to markets, a great illustration is the high dividend yield market. A great example is the Global X SuperDividend® ETF $SDIV which invests in 100 of the highest dividend yielding equity securities in the world. 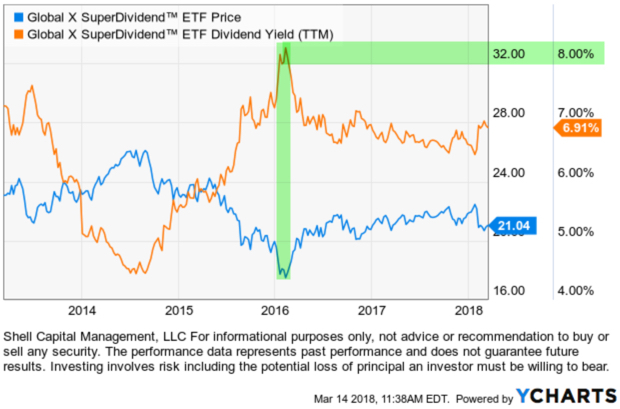 Below is a price chart in blue and it’s dividend yield in orange over the past five years. As you can see, the price trend and dividend yield have an inverse correlation. As the price goes up, the dividend yield from that starting point goes down. That is, if we invest in it at higher prices, the dividend yield would have been lower. But, as the price goes down, the dividend yield from that starting point goes up. If we invest in it at lower prices, our future income from dividend yield is higher. For example, I highlighted in green the price was at its low when the yield was also at its highest at 8%. Investors who bought at the lower price earn the higher yield going forward (assuming the stocks in the index continue paying their dividend yields). If we invested in it in 2014 the yield was 6%. High yielding stocks are not without risks. High yielding stocks are often speculative, high-risk investments. These companies can be paying out more than they can support and may reduce their dividends or stop paying dividends at any time, which could have a material adverse effect on the stock price of these companies and the ETFs performance. You can probably see how an ETF that includes 100 of these stocks may be more attractive to gain exposure rather than risking a few individually. This is an example of when we may use a countertrend system. As I am more inclined to invest in positive trends, this is an example of a situation I may be more willing to buy low. But, I always focus on Total Return. All of my systems include Total Return data that includes the dividend yield, not just the price trend. So as I explain this, keep in mind we still apply my risk management and trend systems but we consider and account for the high yield that makes up its total return. Below is a chart of the Global X SuperDividend® ETF $SDIV from the low point in 2016 (I highlighted in green above). I charted both the price trend by itself as well as the Total Return which includes dividends. Had someone invested in it at the low, we saw above their yield would be 8% and the impact is evident in the difference. With the dividend yield included, the return was 36% and 18% without it. In other words, the dividend was half the return over this period. The higher the dividend yield at the point of entry, the more it can have an impact on Total Return. As a special note for our investment management clients who are invested in ASYMMETRY® Global Tactical. We do not reinvest dividends. Instead, we want the cash dividends to go into the cash portion of our portfolio. Since we usually have some positions that generate a monthly yield, it provides the cash balance we need to cover any slippage between trades, investment management costs, as well as provide cash for other investments. I mention this, because any position we hold like this with a high yield may not appear to have as large of a percentage gain since it only represents the price return, not the total return. That is simply because we are using the cash instead of reinvesting the dividends. In Asymmetric force direction and size determines a trend, I explained how the net force of all the forces acting on a trend is the force that determines the direction. The force must be asymmetric as to direction and size to change the price and drive a directional trend. The asymmetric force was with buyers as they dominated the directional trend on Friday. Friday’s gain helped to push the stock market to a strong week and every sector gained. The S&P 500 stock index is about -3% from it’s January high and closed slightly above the prior high last week. I consider this a short-term uptrend that will resume it’s longer-term uptrend if it can break into a new high above the January peak. After declining sharply -10% to -12%, global equity markets are recovering. The good news for U.S. stocks is the Russell 2000 small company index is closest to its prior high. Small company leadership is considered bullish because it suggests equity investors are taking a risk on the smaller more nimble stocks. As you can see in the chart, the Dow Jones Industrial Average and International Developed Countries (MSCI EAFE Europe, Australasia and Far East) are lagging so far off their lows but still recovering. So far, so good, but only time will tell if these markets can exceed their old highs and breakout into new highs, or if they discover some resistance force at those levels and reverse back down. As we discussed in Asymmetric force direction and size determines a trend it’s going to depend on the direction and size of the buyers vs. sellers. Past performance is no guarantee of future results and that was the case today. After last weeks Selling pressure overwhelms buying demand for stocks for the third day in a row the enthusiasm to buy overwhelmed the desire to sell. Market prices are driven by simple Economics 101: when buying enthusiasm overwhelms sellers, prices rise. The S&P 500 gained 1.16% today and seems to have found some buying interest at the prior range I highlighted in green. Sector breadth was strong with Utilities, Real Estate, and Financials leading the way. We don’t just invest and trade in U.S. stocks and sectors, I look for trends globally across the world. Though the Global ETF Trends monitor below shows many international countries were in the green, the good ole USA was one of the biggest gainers today. Back to the U.S. stock market, in the chart below, I added Kelner Channels to illustrate a few things. Keltner Channels are volatility-based envelopes set above and below an exponential moving average. This indicator is similar to Bollinger Bands, which use the standard deviation to set the bands. Instead of using the standard deviation, Keltner Channels use the Average True Range (ATR) to set channel distance. Kelner Channels show the range of volatility has spread out and got wider since the stock market price trend trended above the upper channel in January, suggesting its uptrend was abnormal. Since then, the trend reversed down and again traded outside the range of the Kelner Channel on the downside. It’s a good example of how the market can overreact on both the upside and downside. In the chart above, I also include the Relative Strength Index, which is on its 50-yard line. You can see how it was reading “overbought” in January (and had been for months), then after that extreme it became oversold. This kind of price action presented us with an opportunity to turn on the swing trading systems. My countertrend systems signaled short-term entries in several stocks and ETFs very near the low prices. I pointed out in Stock Market Analysis of the S&P 500 on February 9th near the lows the breadth of the stock market was oversold at a lower risk. Market analysis is best used as a weight of the evidence. You can probably see how these different indicators signaled a countertrend move was possible and this time that has happened so far. I say this time because it’s always probabilistic, never a sure thing. If the stock market were going to trend down -50% over a two year period it would start off this way being “oversold” and look “washed out”, only to get worse as it swings up and down on it’s way to a lower low. During times like this, a skilled swing trader or countertrend systems can help to generate profits as price trends swing up and down. Below is an updated chart of the percent of stocks in the S&P 500 that are trading above their 50-day moving average. 12% more stocks are trading above their 50-day moving average after today, bringing it to 32%. I point this out because it gives us an idea of how many stocks are still left to trend back up. That is, based on this breadth indicator, there is room for stocks to keep trending up if buyers continue their enthusiasm. This is the opposite of the condition in the last months of 2017 and January when 80% or more stocks were already in positive trends. To revisit this concept I encourage you to read Stock Market Analysis of the S&P 500. The bottom line is, the supply and demand for the stock market seems to be shifting back in control of buyers for now. Only time will tell if it continues in the days and weeks ahead. This is just a quick market analysis to look at what is going on, not investment advice. Our investment management and advice are only offered through an investment management agreement. If you want investment management or advice, contact us. Investors are driven by fear and greed. That same fear and greed drives market prices. It’s Economics 101 “Supply and Demand”. Greed drives demand, fear drives selling pressure. In fact, investors are driven by the fear of losing more money when their account is falling and fear missing out if they have cash when markets go up. Most investors tend to experience a stronger feeling from losing money than they do missing out. Some of the most emotional investors oscillate between the fear of missing out and the fear of losing money. These investors have to modify their behavior to avoid making mistakes. Quantitive rules-based systematic models don’t remove the emotion. Amateur portfolio managers who lack experience sometimes claim things like: “our quantitive rules-based systematic models removes the emotion”. That couldn’t be further from the truth. Those who believe that will eventually find themselves experiencing feelings from their signals they’ve never felt before. I believe it’s a sign of high expectations and those expectations often lead to even stronger reactions. It seems it’s the portfolio managers with very little actual performance beyond a backtest that make these statements. They must believe a backtested model will act to medicate their feelings, but it doesn’t actually work that way. I believe these are the very people who over optimize a backtest to make it perfectly fit historical data. We call it “curve-fitting” or “over-fitting”, but it’s always “data mining”. When we backtest systems to see how they would have acted in the past, it’s always mining the data retroactively with perfect hindsight. I’ve never had anyone show me a bad backtest. If someone backtests entry and exit signals intended to be sold as a managed portfolio you can probably see how they may be motivated to show the one that is most optimized to past data. But, what if the future is very different? When it doesn’t work out so perfectly, I think they’ll experience the very feelings they wish to avoid. I thought I would point this out, since many global markets have been swinging up and down. I’m guessing some may be feeling their feelings. The CNN Fear & Greed Index shows investor fear and greed shifted to Extreme Fear a month ago as the popular U.S. stock indexes dropped about -12% or more. Many sectors and other markets were worse. Since then, as prices have been trending back up, Greed is now the driver again. I believe fear and greed both drives market prices but also follows price trends. As prices move lower and lower, investors who are losing money get more and more afraid of losing more. As prices move higher and higher, investors get more and more greedy. If they have reduced exposure to avoid loss, they may fear missing out. This is the challenge in bear markets. In a bear market, market prices swing up and down along the way. It’s these swings that lead to mistakes. Below is a chart of how the Fear and Greed Index oscillates to high and low points over time. Investors who experience these extremes in emotion have the most trouble and need to modify their behavior so they feel the right feeling at the right time. Or, hire a manager with a real track record who can do it for them and go do something more enjoyable. When I say “The Trend” that could mean an infinite number of “trends“. The general definition of “trend” is a general tendency or course of events. But when I speak of “The Trend” I mean a direction that something is moving, developing, evolving, or changing. A trend, to me, is a directional drift, one way or another. When I speak of price trends, I mean the directional drift of a price trend that can be up, down, or sideways. Many investors are probably wondering about the current trend of the U.S. stock market. So, I will share a quick observation since one of the most popular U.S. stock indexes seems to be right at a potential turning point. Below is a 6 month price chart of the S&P 500 stock index. The S&P 500® is widely regarded as a gauge of large-cap U.S. equities. Clearly, prior to late August the stock index was drifting sideways. It was oscillating up and down in a range of 3% to 4% swings, but overall it wasn’t making material higher highs or lower lows. That is, until late August when it dropped about -12% below its prior high. Now, we see with today’s action the stock index is attempting reach or breach it’s very recent peak reached on August 27th. If the index moves above this level, we may consider it a short-term uptrend. We can already observe the index has made a higher low. You can probably see how the next swing will determine the direction of the trend. If it breaks to the upside, it will be an uptrend as defined by “higher highs and higher lows”. Although, that is a very short-term trend, since it will happen within a more intermediate downtrend. My point is to observe how trends drift and unfold over time, not to predict which way they will go, but instead to understand and define the direction of “the trend”. And, there are many different time frames we can consider. If this trend keeps going up, supply and demand will determine for how long and how far. If it keeps drifting up, I would expect it may keep going up until some inertia changes it. Inertia is the resistance to change, including a resistance to change in direction. But if it instead goes back down to a new low, I bet we’ll see some panic selling driving it even lower. The real challenge of directional price trends is if this is the early stage of a larger downward trend (like a bear market), there will be many swings along the way. In the last bear market, there were 13 swings that ranged from 10% to 27% as this stock index took about 18 months to decline -56%. Below is the same stock index charted with a percentage chart to better show the percent changes over the past 6 months. You can probably see how it gives a little different perspective. I don’t necessarily make my tactical decisions based on any of this. I enjoy watching it all unfold and I necessarily need to define the trend and understand it as it all plays out. I want to know what the direction of the trend is based on my time frame, and know when that changes. For informational and educational purposes only, not a recommendation to buy or sell and security, fund, or strategy. Past performance and does not guarantee future results. The S&P 500 index is an unmanaged index and cannot be invested into directly. Please visit this link for important disclosures, terms, and conditions.